Our sales manager training program focuses on core skills that will improve sales managers’ coaching, hiring, business planning and performance management skills! In Focused Sales Coaching™, your sales managers will learn how to effectively coach and develop their salespeople to be top performers – leading to increased sales, better engagement, and improved job satisfaction. Sales managers learn the five-step Focused Sales Coaching™ methodology to enhance their sales coaching skills and accelerate the development of their sales team. Steven follows up monthly to ensure that your sales managers are successfully implementing and mastering the Focused Sales Coaching™ methodology. ARE YOU A HIGHLY EFFECTIVE COACH? The Coaching Effectiveness Snapshot™ is a proprietary 180-degree assessment that provides feedback from your salespeople on the quality and effectiveness of your coaching. Sales Rep Receptiveness: Are your sales reps open to being coached? For coaching to work, sales reps must be open to being coached. Leadership: Are you clearly setting and communicating common goals? Support of Sales Activities: Are you helping your sales reps focus on the most important opportunities and customers? Coaching Flexibility: Are you adjusting your coaching style based on the individual and situation? Performance Coaching: Are you holding your salespeople accountable for following through on their own business plans and commitments? Coaching Time: How much time are you spending coaching your salespeople every month? 180-degree feedback is a simple and effective way to identify an individual’s strengths and highlight areas where development would have the largest impact on improving performance. We compare feedback from your salespeople and your self-assessment which helps to identify your coaching effectiveness. 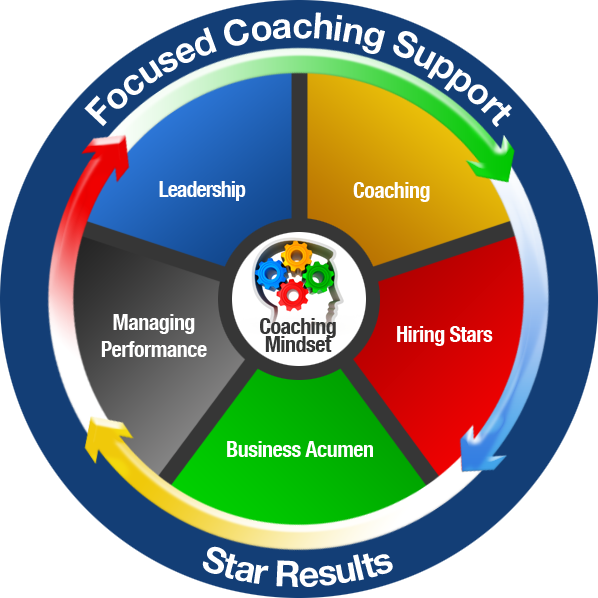 The result is a feedback report that provides a more complete picture of your coaching.Doing a 180-degree feedback before taking Focused Sales Coaching allows you to identify your coaching strengths and areas for improvement. This, in turn, allows you to develop specific development goals and areas of focus. Are you tired of making hiring mistakes? In Systematically Selecting Sales Super Stars, you will learn how to more effectively select top-performing salespeople. Steven will teach you a three-step, systematic process to identify better reps who can deliver improved team performance and sales results. The sharpest salespeople and managers don't always stand out in an interview, so being able to systematically determine which candidate has the potential to be a top performer is critical. Selecting salespeople who know how to sell is easy; finding the ones who "will" sell has always been the biggest challenge in sales management. Too many managers hire on "gut." Learn how to develop your sales reps into strategic business people. Steven teaches sales managers simple approaches to coaching their sales reps to view their business strategically. They will make wiser decisions, plan better, and effectively allocate their resources based on customer needs and potential for growth. Sharper decision-making and use of resources by both you and your salespeople will generate greater ROI. Are you effectively managing performance in your district? In Managing Performance for Results, Steven teaches sales managers simple approaches to conducting quarterly business reviews, managing non-performing sales reps and managing your boss. The Managing Performance seminar is the perfect complement to the Demystifying Business Acumen seminar. You will improve sales rep accountability in executing their business plans and rapidly as well as effectively address performance issues. Steven Rosen is recognized as one of the top 50 sales thought leaders by Top Sales World. He is a leading sales leadership coaches and the founder of STAR Results, a coaching, and training organization dedicated to leadership development. Steven's passion is delivering ongoing development opportunities for sales leaders. He knows sales inside and out – he's been in the trenches and commanded the troops. His clients commend him as a valued partner and personal mentor who has helped transform their sales organization and inspired their sales executive and managers. Improve your coaching, hiring, business planning, leadership and performance management skills! Our sales management seminars for sales managers will enhance your skills and ignite team performance. We help you develop great sales managers who inspire STAR Results!